IMPORTANT NOTE: Do not try to install firmware or software for the Power Master II into an old Power Master (A.K.A: Power Master I) or vice-versa. The download links available on this webpage are for one or the other model. Scroll down to the Downloads Section and please BE CAREFUL WHEN SELECTING THE DOWNLOADING LINK. 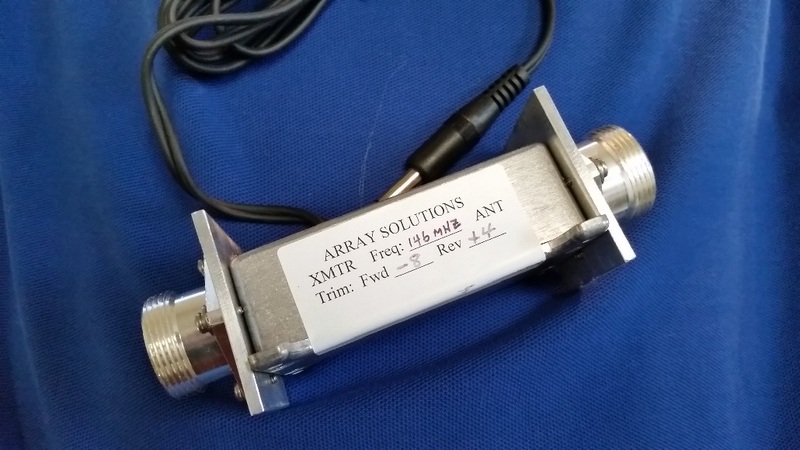 HF/6 m coupler. 3 kW and 10 kW ratings available. Peak Hold Modes – programmable for fast (0.5 sec), medium, slow, and Long ( 5 sec) for CW, SSB, data, FM, whatever you're sending! 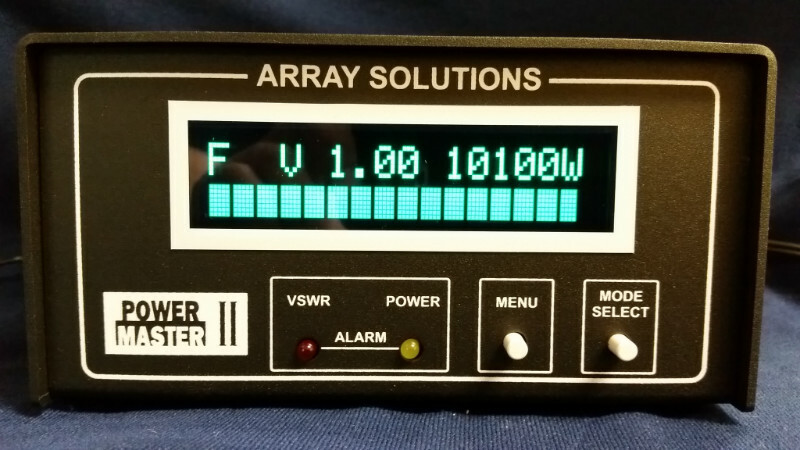 VSWR Alarm – programmable trip point, LED and Relay – Can shut down your amp fast! 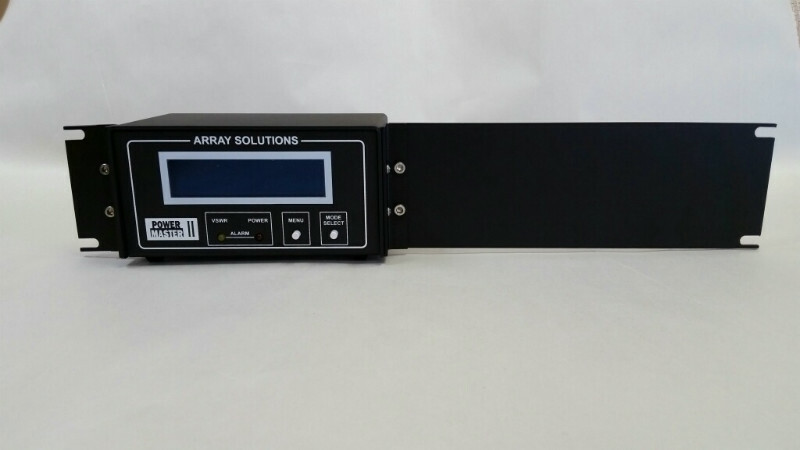 Programmable from front panel or via USB or RS-232 – Even display your call letters in it too! And did we mention the best support you can get from us and our user group? 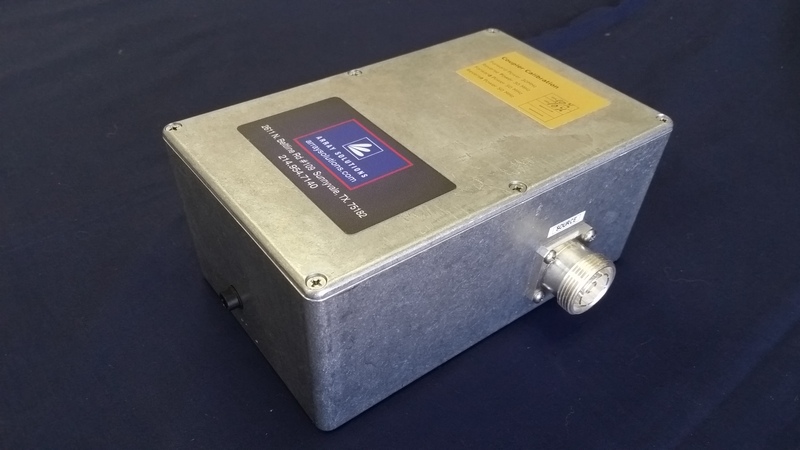 Why not buy the same VSWR Power meter that is used by industry for critical monitoring functions? 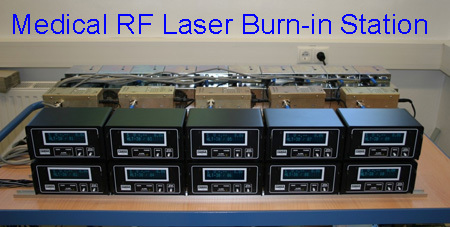 Used by industry for critical testing - above shows 10 PowerMasters testing 10 RF generators. Options for 19" rack mounts: One display left or right side, one display centered or two displays side by side. Left: PMC-2. "Y" adpater for the coupler cable, up to five couplers can be connected to a Power Master II Display. Center: PMCC. 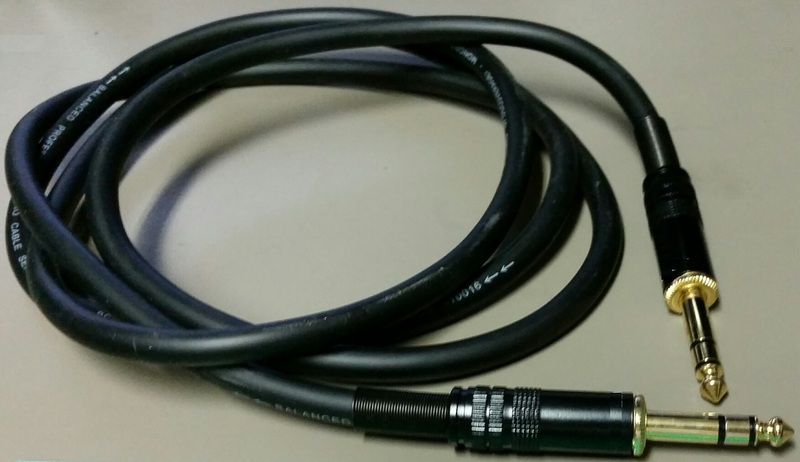 The standard 6 feet (1.83 m) coupler shielded cable has stereo 1/4" plugs on both ends. 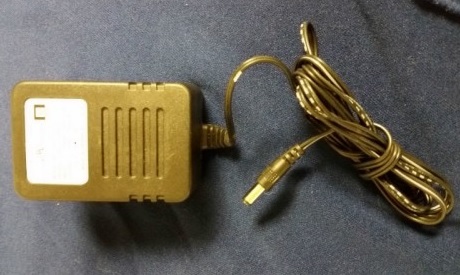 A much longer cable can be used if necessary. 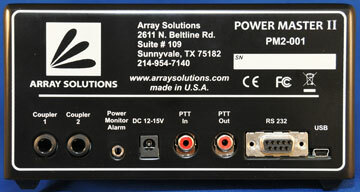 Right: PS-12R1A, regulated, noiseless linear power supply for the PowerMaster. We can build special needs Power Master Couplers, for higher power applications. PowerMaster II, it most have the "II" on the logo, otherwise it is a PM1. - New small display, allows multiple instances of PM running on the same computer and also indicates which coupler is being used. - Support for multiple instances of PM on same computer. Start with ini=name_of_ini_file . IMPORTANT: If in your PM-I display you do have the "Refresh Display" option, you don't need to update the firmware. 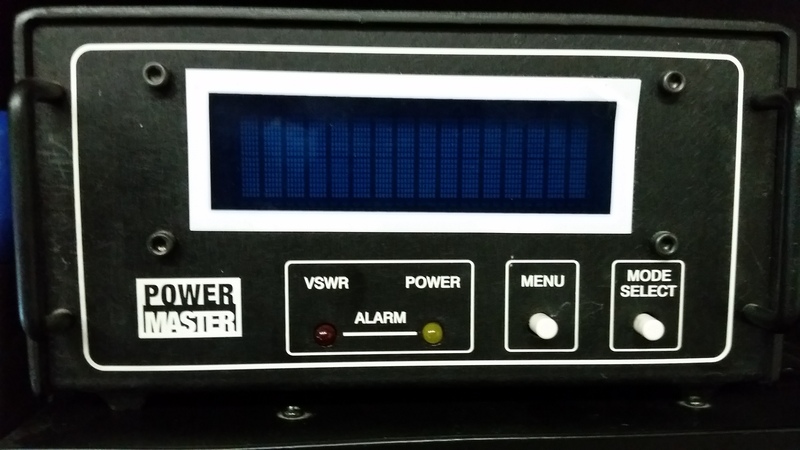 NOTE 2: Do not ATTEMPT to install the 3 kW firmware on a PowerMaster-1 that has a 10 kW firmware or vice-versa. 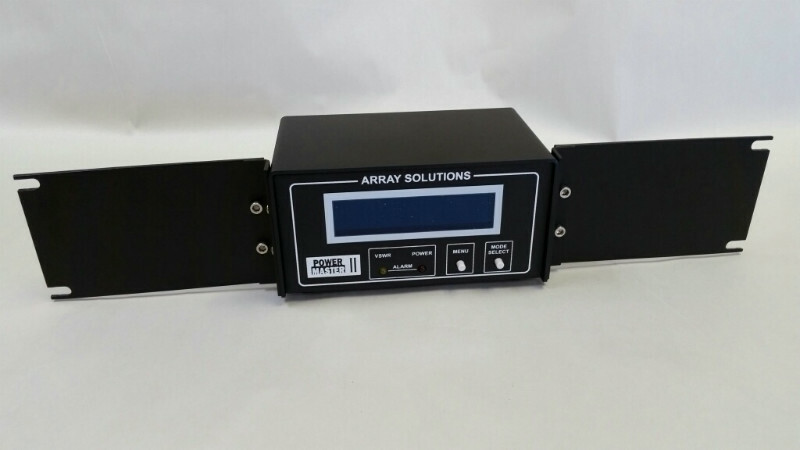 The Array Solutions VHF and UHF couplers extend the frequency range of the PowerMaster Series Digital RF Power & VSWR Indicator to the 2m, 1.35m and 70cm amateur bands. 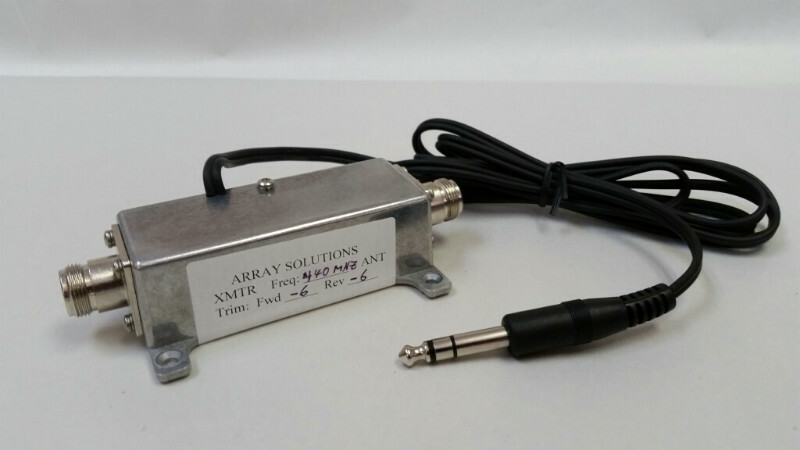 The VHF and UHF series couplers are precision dual directional couplers. 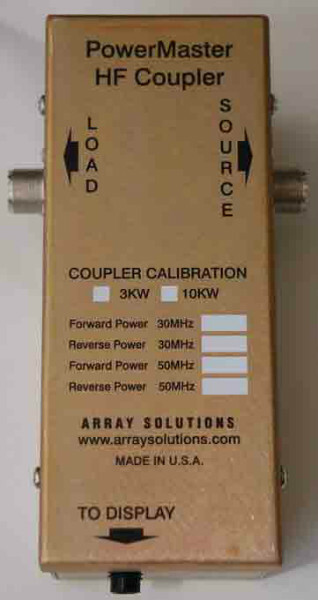 They have dual pickup loops to provide simultaneous forward and reflected power measurements. 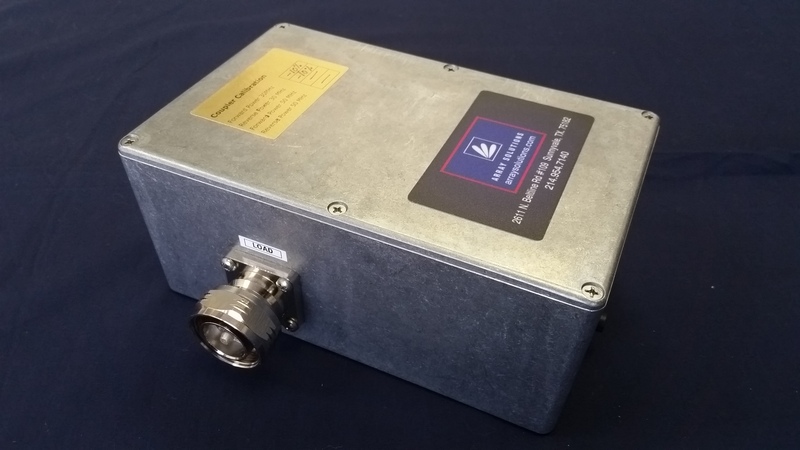 The PowerMaster VHF and UHF couplers may be inserted in the antenna feedline at any convenient point. The end of the coupler that is marked “ANT” is connected to the feedline that goes to the antenna. 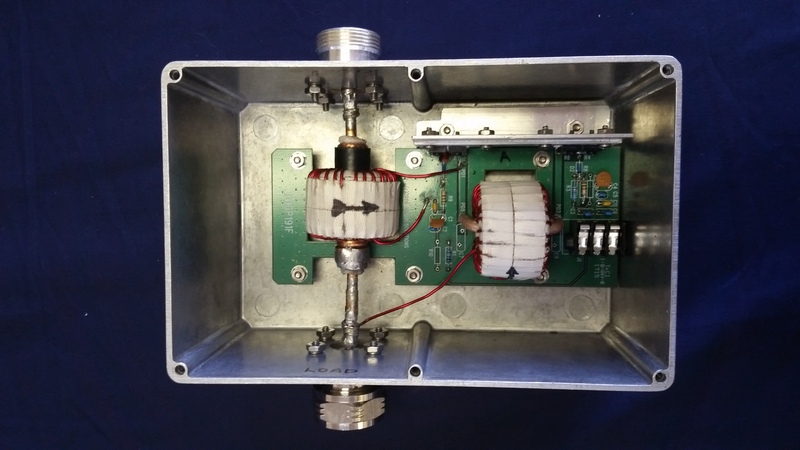 The other end is connected to the transceiver or linear amplifier. 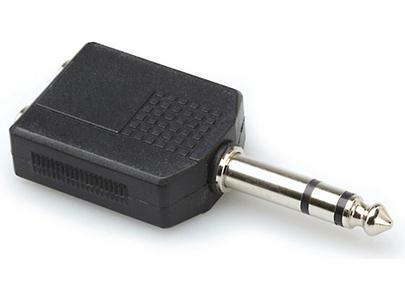 The cable with 1/4” phone plug is plugged into the PowerMaster or PowerMasterII display unit. Enter the trim factor for both forward and reflected power, The trim factors are marked on each coupler. Refer to the PowerMaster/PowerMasterII Manual for instructions on setting the trim factors. 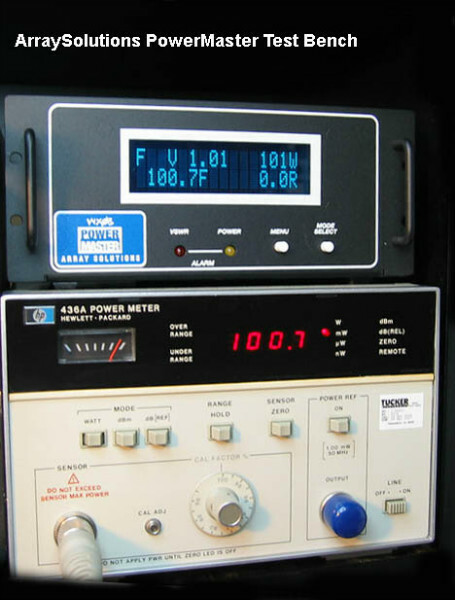 With the proper firmware loaded, operation and display features are the same as with a HF coupler. 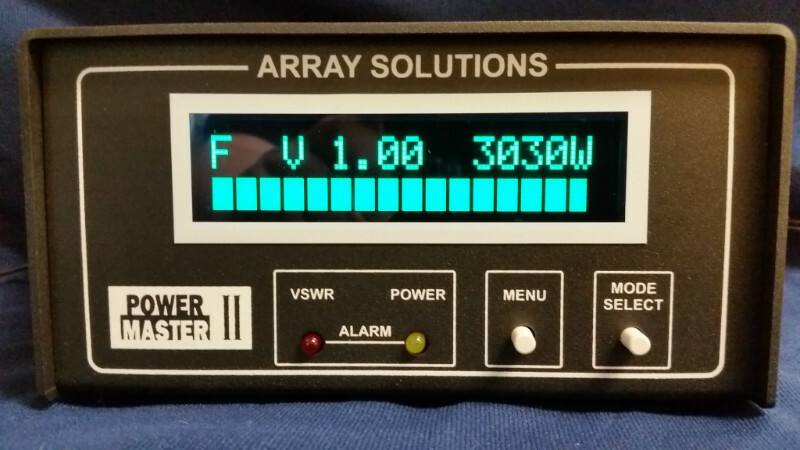 Refer to the Array Solutions PowerMaster Series Digital RF Power Meter manual for instructions on the PowerMaster Series operating procedures and display features. 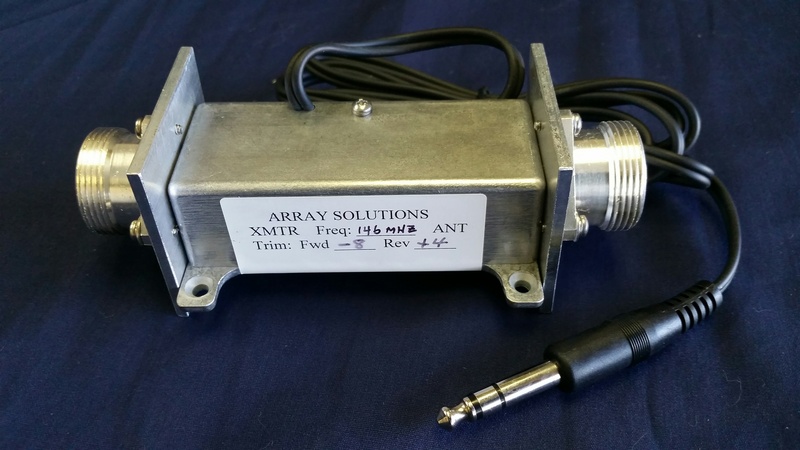 There is no maintenance required for the VHF/UHF couplers. There are no user adjustable components inside the couplers. Do not remove the coupler cover or disassemble it in any way as calibration will be lost. Avoid anything that would apply a significant shock to the couplers such as dropping them or hitting them with any object. A mechanical shock can cause movement in the pickup loops which may affect the accuracy of the couplers. 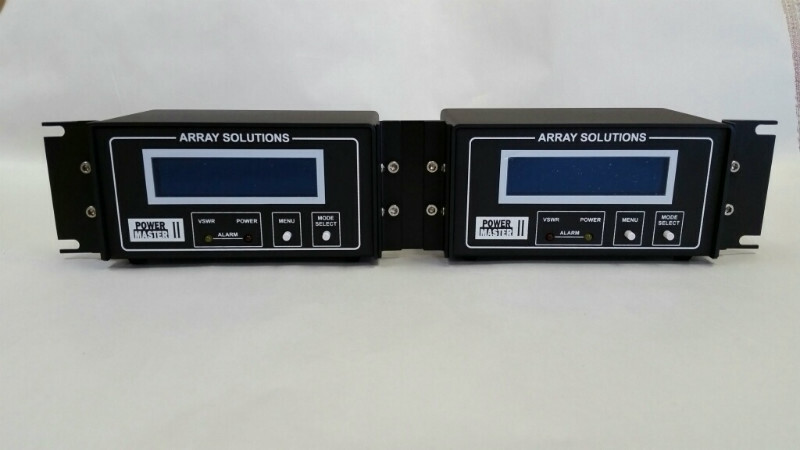 Should you suspect a problem with your VHF or UHF coupler call Array Solutions for instructions on how to return the unit for repair and calibration.